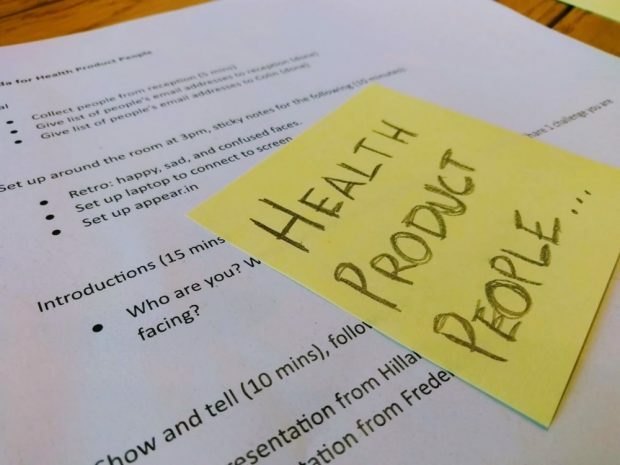 At our sixth event, we looked at different prioritisation methods. We had attendees from the Department of Health and Social Care, Care Quality Commission, NHS Digital, Public Health England and NHS Business Service Authority. Hilary talked about how difficult it can be to accept that something isn’t as urgent as something else, but if you think about what you can do now, you know you can do something else later. Saying no just means not now. The classic prioritisation method employed by most product teams is MoSCoW. Hilary has seen teams struggle to decide how important a feature should be. She described teams ending up with a long list of ‘Must Haves’. By getting the team to dot vote you can decide on your main area of focus. Hilary talked about RICE, an example of a quantitative method for prioritising work. Hilary’s main takeaway was for teams to be not afraid of tweaking the methodology. Matrices are less onerous than scoring systems. You could look at value vs risk, or impact vs effort. It’s important to define what these criteria mean. For example, ‘effort’ can be defined as time or resources. Cost of Delay looks at comparing urgency and value. It’s a useful technique to employ if you have limited resources and limited budget. If you want to try a fun way to prioritise with a team, then follow the Thirty-Five technique. Case study: on the NHS UK alpha project, the team wanted a way to decide between a list of competing priorities. They employed the Pandora technique to help the team decide. The question the team wanted to answer was “will this product/project deliver more value to the public than any other?”. Case study: The Fleming Fund team used Trello to organise their work to stop duplication, track work and set priorities. Further reading: if you want to read more about prioritisation, Hilary recommended the following resources: Gamestorming, Liberating Structures, Hyper Island Toolbox, Tasty Cupcakes and re:work with Google. Picture of some of the attendees in the room, others had dialled in. Fred explained that he has been working on research briefings for the new website for Parliament. Fred talked about the challenges working in a relatively new digital service. Fred looked at defining ‘Value vs Cost’ but preferred ‘Value vs Effort’. Fred talked about the priorities should always have the end user in mind. He agreed with Hilary that prioritising as a team is great as it gets everyone to buy into what they are doing. Fred then talked about the challenges of having to juggle his team’s priorities with another team he was dependent on, which affected the pace his team could move at. Ultimately, it meant that they couldn’t move forward with the work even though they wanted to. Fred sparked a fascinating discussion when reflecting. Fred would have been bolder, and made the tough decision to stop work sooner given the circumstances he faced. This is easier said than done. It’s hard when you are passionate, committed but the stars aren’t aligned for your team to progress. To facilitate discussions after the show and tell we trialed the lean coffee technique (the name is a bit of a misnomer as we didn’t provide any coffee — sorry!). Silent prioritising —often used in conjunction with MoSCoW. People move post it notes around, without speaking, into priority groups. This stops the activity descending into a debate. In our efforts to make this community helpful to our colleagues, we then ran a short start/stop/continue retrospective & sent a survey to see what we should begin doing, what we need to stop and what should continue. Below are the responses. Hearing about other people’s experience. Topics discussed were timely, and relevant. For some, it helped them decide on what to do next. The venue worked for people. Hearing from speakers from other areas of public service. Allowing people to contribute, discuss and share ideas. Diverse group and experience at the event. There are established product communities across health (NHS Digital, PHE, CQC etc.) — all want to be further involved in future events! The community wanted to see more case studies and examples of things being shown in practice. The community didn’t ask us to stop any of the current practices, so we must be doing something right! Are you part of the Department of Health and Social Care? Are you part of one our Arm Length Bodies? Interested in sharing your ideas and work with others? If you answered yes to any of the questions above, sign up to receive email updates and find out how you can get involved.